CE-ST series are provided with mounting plates, gland plates and locking system as standard. CE-TEK’s CE-ST IP66 range of mild/stainless steel enclosures are available in 48 popular sizes and suitable for wall mounting in harsh environments where durability is an important factor. CE-ST enclosures are fitted with a bottom gland plate and internal mounting plate as standard and finished in grey (RAL 7035) as standard. 9 popular sizes are also available in white (RAL 9010) which are suitable for the refrigeration industry. 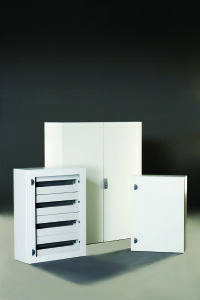 Optional extras include: roof canopies, internal doors, modular frames, door stops and wall brackets.